"Jesus, I can't see a damn thing," Belphi said, tightly gripping the wheel of the Ford 4x4. The wind, gusts hitting over a hundred knots, rocked the truck, and the blowing snow reduced visibility to about fifteen feet. "A little to your right," I said as a dark shape loomed faintly off to the side, too obscure to make out. "I think we're coming up on the runway." We worked our way closer to the shape, and something about it, though strangely distorted, struck a note, then snapped into focus. It was a neighbor's PA-16, one we knew well, on its back. Obviously, the wind had broken it from its tiedown and blown it several hundred feet to the runway and its present position. "You called that one right," Belphi said in disgust, looking at the airplane, or rather, what was left of it. "Let's get over and see how the Cub's doing." We were living temporarily in Wasilla where there was electricity to run a word processor so I could do some writing, and, for the first time since I came to Alaska, I was forced to base my airplane at a public airport. I found it a less than edifying experience. Especially at times like this. As we crept around the PA-16, a gust moved it several feet further along the ground, in the direction of the fuel pumps and highway. Then we reached the row of tiedowns and began to creep slowly along it, our Super Cub still not in sight. I could feel the tension building, a form of tension I was unused to, then our airplane finally loomed out of the blowing snow. It was still in place, riding the gusts nicely as it had been doing the previous evening, and even the wing covers, which now were serving as control locks, were still attached. I had not expected otherwise, of course, but then, the way my airplane had been tied down was not the source of my concern. "Let's see how accurate your prediction really was," Belphi said, and I nodded. I too was curious. Wasilla was one of those airports where each person installs his own tiedowns, and one day just before winter hit I went down to the airport after my morning's writing stint and discovered I had a new neighbor. It was the PA-16, and like many airplanes you encounter on public airports, it was carelessly tied down. The ropes were old, rotten and loose, and almost thin enough to be considered string. I took one look, and it didn't take a seeress with a crystal ball to read the future. Later in the year a strong winter high would build in the interior, with a deep low off the coast, and through Chickaloon Pass the wind would roar, sweep across the airstrip from the northeast, grab the PA-16, tear it loose from its tiedowns, then blow it into and over my airplane, destroying it. So I made a point of looking the PA-16's owner up, and having a neighborly little chat with him. But his attitude was that his way of tying an airplane down was perfectly adequate. "Never had any problems before," he said. So I shrugged, the world being full of people like him, and moved my Super Cub down the row far enough that it was out of his way. But this wasn't the end of it, for as soon as I moved my Super Cub, two new airplanes came onto the field. The first, an Ercoupe, parked in my old spot. I warned the fellow who owned it about what might happen, but he was unconcerned, so I said nothing further; being a good neighbor has its limits. Then, a few days later, I found a Stinson parked immediately next to my Cub. And it, too, was tied down in such a way that the first real storm would tear it loose. A little investigation revealed its owner was a guy working on the pipeline, and that he was on the Slope. But one day as I went to check my airplane, I found a young woman at the Stinson and fell into conversation with her. Turned out it was her husband's plane, and when I explained the problem with the tiedowns, she got in her car, drove over to the hardware store, and bought some 1/2" nylon rope, like I used. Good woman; figured her husband, who was new to flying, would want her to take care of the problem in his absence, which turned out to be the case. "Well, Ron's plane is okay," Belphi said as we passed the Stinson, then came up to the Ercoupe and parked. "Gonna set up a tent at the next Anchorage Street Fair? Tell fortunes?" I said nothing, just sat there and looked at the Ercoupe in silence. Like the PA-16, there wasn't much left of it, and the tragedy was that there was no excuse for this. It takes so little to tie an airplane correctly, and the reward is so great. "They never learn, do they," Belphi added thoughtfully. "Except for those like Ron and his wife. You gonna put a chapter in your book about this, for those who could use the information?" "I hadn't planned on it," I said. "But you're right -- it is a problem, and there certainly are a lot of pilots who don't seem to know how an airplane should be secured against high winds." "Well, mention me in it," she said, grinning. "Okay," I said, smiling. And we returned to the Super Cub, so I could climb out of the truck into the -85 degree F/-65 degree C wind-chill factor and re-tension the ropes, something that often needs to be done daily during the more serious storms. There is a certain security that comes with living in the remote bush (call it one of the "perks"), and this security extends to our airplanes, even if they are parked on a remote wilderness gravel bar. True, nobody is going to come and hold your hand if your airplane gets destroyed by a powerful wind storm, but then, if that event does happen, at least you do not have to search very far to discover where the fault lies. This being so, let's take a systematic look at how permanent tiedowns should be installed at a base camp. I prefer to face my airplanes into the prevailing wind, whenever possible. I went to an abandoned mine and selected three rusted four-cylinder engine blocks from the operation's dump. These I took to Spruce Point in the Super Cub. Through one cylinder of each block I passed a galvanized steel chain with an inside link diameter of five-eights of an inch. The end link at the block was secured to the appropriate link on the main length of the chain with a sturdy bolt. I dug three holes about three feet deep. In each hole I placed a block, with the chain coming out the hole. I then filled the holes with rocks and dirt, and compacted it well. The chains were long enough to reach two feet above the surface. The reason for this length was to protect from snow and ice abrasion the nylon ropes that went from the end of each chain to the airplane's tiedown rings. A few years later, when I was able to afford a C-180 and additional tiedowns became necessary, I went through this process again, although this time, since there were no more scrap engine blocks available, I had to resort to old pumps and similar bulky, weighty junk for my anchors. I use high-quality 1/2" twisted three-strand nylon mountain climbing rope. When the rope begins to show signs of fraying, or is over two years old, I replace it. Knots and tension will be treated together, for together they provide the strength and resiliency necessary to defend an airplane against high winds. The bowline. Starting at the bottom, fasten your rope to the tiedown ring or chain with a simple bowline knot (see illustration 40). The bowline is the best (I'd go almost so far as to say only) knot to use for this purpose. Easy to tie, and easy to untie, the tighter the rope is pulled, the better it holds. Tension. Once the bottom of the rope has been tied to its chain or ring, put the upper end of the rope through the wing's tiedown ring and apply a slight amount of tension. What you want the airplane to do in a wind storm is to give slightly in the gusts, but no more. It is a matter of minimizing the shock load the airplane receives from the gusts, and the combination of both the 1/2" nylon rope's tension, and ability to stretch slightly under strain, provides considerable protection. A good way to gain an understanding of this process is to consider what happens to airplanes that have been tied down with their ropes slack. Go to any airport and there they are, just waiting for the next serious storm. Then afterward, as their owners survey the scene of destruction (see illustrations 41 and 42), they just shake their heads at the unfairness of fate. "Stuff happens," they say, shrugging, and continue on their way. Business as usual. Well, "stuff" doesn't just happen. It is caused. Let's take a look at what is going on here. On a nice day, everything is fine. The slack in the ropes allows the airplanes to rock gently in the breeze, and everything is right with the world. But then, one day or night, a serious storm arrives on the scene, and things change. As the wind picks up, the rocking becomes more pronounced, and the ropes begin to stop the wing's upward movement. Things are still okay, though, for the wind has not yet developed enough force to over-stress anything. But then the gusts get stronger, and the situation becomes critical. For when they start to hit hard (say, 75 to 100 knots), the wing swings up, then slams to an abrupt halt as the rope snaps tight. The force caused by the moving mass of the wing, combined with the force of the gust, is then focused on the small area of the wing's tiedown ring, and sooner or later, under repeated assault, something is going to give. Sometimes it is the ring, other times the rope. But whatever it is, the airplane maintenance shops are gonna smile and the insurance companies cry. It is easy to see why chains (used by many pilots, and FBOs) are worse in this situation, for while good 1/2" nylon rope has a certain amount of give to lessen the shock, a chain has none. Now that you have the bottom end of your rope attached to your anchor, and the top end has been reeved through the wing's tiedown ring with a slight amount of tension applied, the rope will need to be secured. The best system of knots to use here is called the Hurricane Hitch. What you do is take two turns around the standing part of the line a couple of inches below the ring, jamming the second turn under the first to hold it in place. The tension on the rope will be held by the two turns. Make a second jammed pair of turns a few inches below the first, and then a third a few inches below that. (Illustrations 43 and 44 show clearly how this should be done.) Then the end of the rope is half-hitched just below the third jammed pair, and that's it. Sometimes with Super Cubs and C-180/185s ring paranoia strikes, and the mistrustful soul will tie the rope around the strut rather than use the factory's tiedown rings. The correct way to do this is shown in illustration 44. Any time of the year you might have to land someplace where tiedowns are not available and you will have to make your own. The worst place for this to occur is at some of those big commercial airports in Canada where provision for general aviation has deliberately been ignored. This is a tough nut to crack, because for some obscure reason they don't want you digging holes in their ramp, or during winter freezing pieces of wood to it. Fortunately, airports on the main inland route to Alaska like Prince George, Fort St. John, Fort Nelson, Watson Lake, and Whitehorse provide tiedowns, but at airports like Vancouver, Yellowknife, or Inuvik, you can forget about these little niceties. There is no question that the bush is more friendly. Winter. This is easy. Just dig three holes in the snow, and lay a twenty-four inch length of whatever wood is available in each one, with a rope attached. Then fill the holes with snow, compact it firmly, and pour water on it. (If an open creek isn't handy, melt some snow using your preheating equipment, or a campfire.) Shortly thereafter the snow will freeze to solid ice, and your tiedowns will be ready for use. This system has worked very well for me over the years, and several times has easily withstood extended winds gusting over 100 knots. Needless to say, every time this technique is used, your ropes will get a little shorter, for you have no choice but to cut them free just above the surface prior to leaving. Summer. In summer, when the winds are not so fierce, you do not have to take the extreme precautions that you would in winter, but then, putting in a good temporary tiedown is also more difficult. I often seek out clumps of willow, birch, or cottonwood to use as tiedown anchors (see illustration 12), and for temporary use this works well. Driftwood logs, if they are heavy enough, or partially buried in sand and gravel, also work well. Otherwise, holes will have to be dug, and chunks of wood buried to serve as anchors. Whatever the situation, you are going to want to tie your airplane down if wind is on the agenda. "I'm glad we don't keep our 206 over there," Elaine said, gesturing out her side window as we taxied past a row of airplanes on the Tucson ramp. I was many years, another marriage, and 2,300 miles away from the incident reported earlier, and we were making like snowbirds and spending the winter in Arizona. "Yeah," I said, casually glancing at the loose chains. "One of these days a good thunderstorm is gonna pass through, and that line will turn into a junkyard." "Well, I'm glad you're renting a hangar, even though it costs an arm and a leg," she said. "Though at least one of those planes seems to be tied down okay." "The yellow Cessna 140? With the ropes on it?" "Oh, no wonder," Elaine said, thinking of the beautiful, hard-nosed, and highly competent DE with whom I took my six-month instrument check rides with when we both happened to be in town at the same time, I down from the arctic, and she from her airline pilot's job in Texas. "But doesn't she worry about it?" "Sure, but what can she do? She can't afford a hangar right now, so she just has to tough it out." Elaine sadly shook her head. Like me, she didn't need a crystal ball to read the future, and only luck was going to protect Barbara's airplane from the incompetence and carelessness of her neighbors. Unfortunately, in aviation luck can't be counted on. And in this instance, that proved to be the case. Less than two years later, during the monsoon season, a serious thunderstorm passed over the airport and swept down the line of airplanes. Some of the results of its passing are shown in illustrations 41 and 42. As illustration 41 shows, Barbara's Cessna 140, having been properly tied down, didn't budge. But the same can't be said for the Cessna on its back, which had been loosely secured with chains; one of them can be seen hanging from its tail. Illustration 42 shows the other airplane involved in this sordid little triangle. 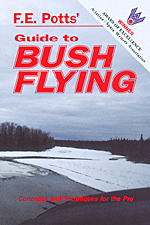 Bush Flying, like all forms of flying, is a matter of details. And no detail is too small not to be important. There is an old saying that a flight is not over until the airplane is parked and properly tied down. Nowhere is this more true than in the bush, where help is unavailable. This is the reason the pro takes such care of seemingly minor details, and, in these details, survives.